It turns out that after a summer of mainly crafting for other people, September has been the selfish knitting month. 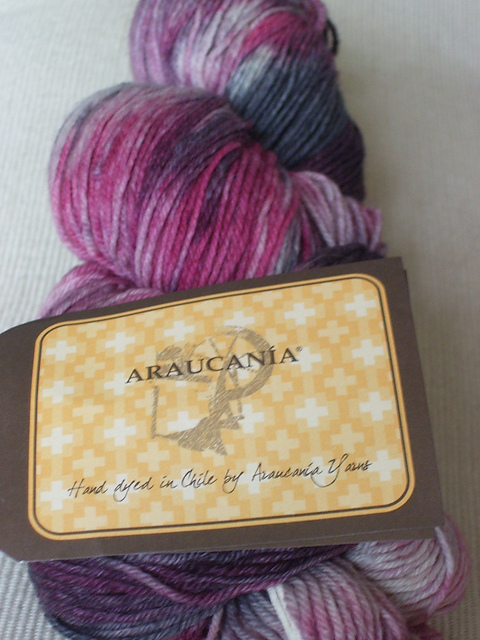 The package I received from the Studio Ghibli swap included a skein of Araucania Ranco Multy (colour 332). I don’t usually buy variegated yarns for myself, not for any particular reason or dislike, I just don’t. So, I was a little unsure of what I could do with it that would look nice. 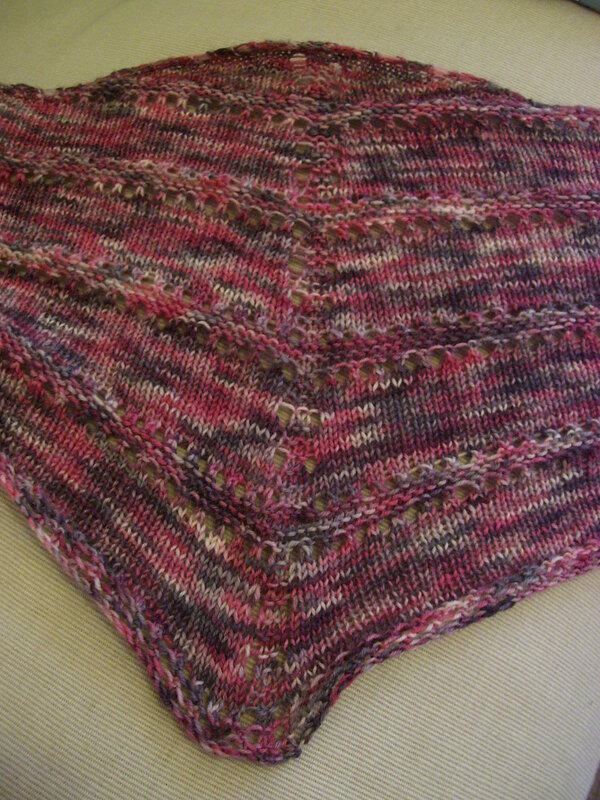 After having a look at other projects knitted in the same yarn on Ravelry, I decided on a shawl. Actually, I was already leaning towards a shawl because it’s a good way to use up one skein of sock yarn and I wanted another shawl as the weather is getting colder; I was just a little hesitant about it. 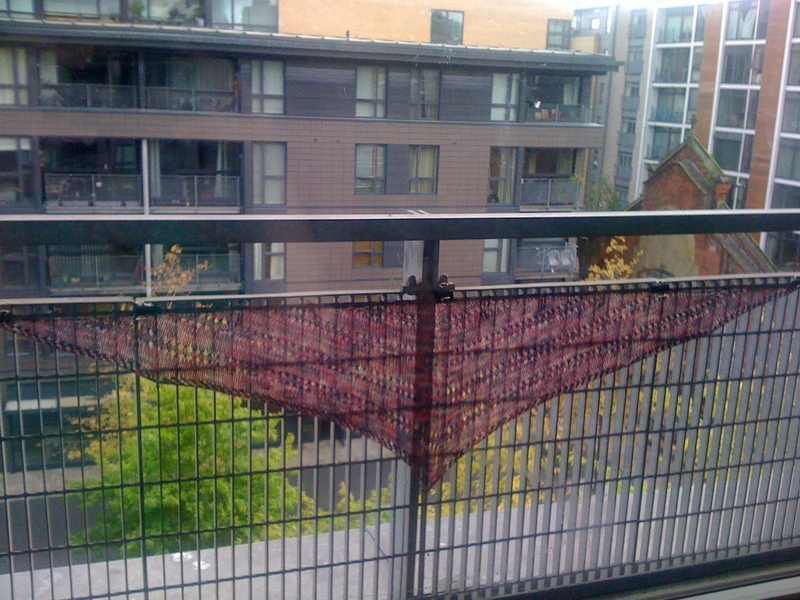 I didn’t want to choose something really nice and lacey and then be disappointed if the colour variations and lace patterns clashed, but after a few minutes of browsing Ranco Multy shawl projects I started noticing that I kept clicking on the project details of the same shawl, Azzu’s Shawl. 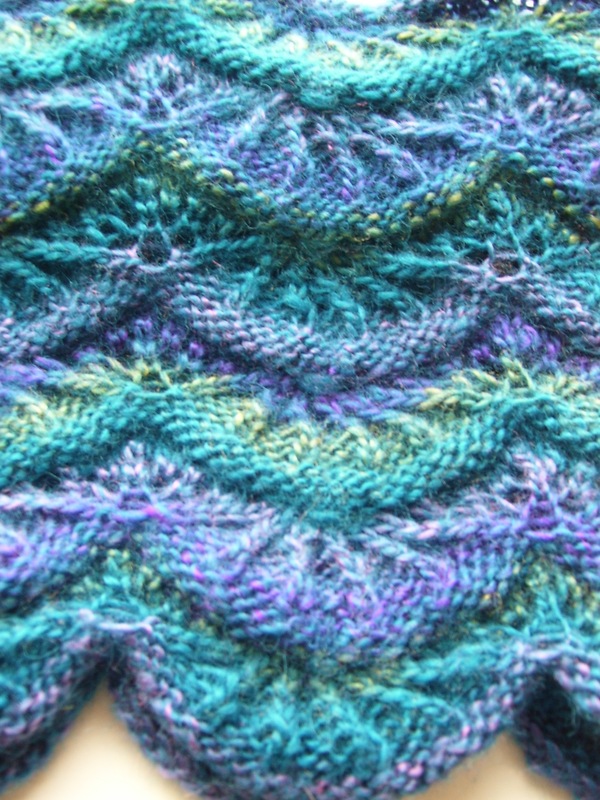 Conveniently, the suggested yarn for the pattern is Araucania Ranco Multy. It only took me a week to knit, though I did take a bit of a break towards the end. I forgot a yarn over somewhere and didn’t touch it for a couple of days because I needed to count the stitches to make sure I fixed the mistake. I think I had over 200 stitches and just couldn’t be bothered to count them. In the end, I mustered up the motivation to count the stitches and got on with the stocking stitch. The stocking stitch was the main problem with the pattern, especially when you realise that you’ve only knitted 2.5 rows or less during a 30 minute tv show, which wasn’t the case two days ago. With that said, it’s only a problem because of how boring stocking stitch is on 4ply and is in fact needed to show off the colours in the yarn. So, there really aren’t any problems with the pattern and I think it would be a great first-big-project project for a beginner and is an excellent pattern for variegated yarns. 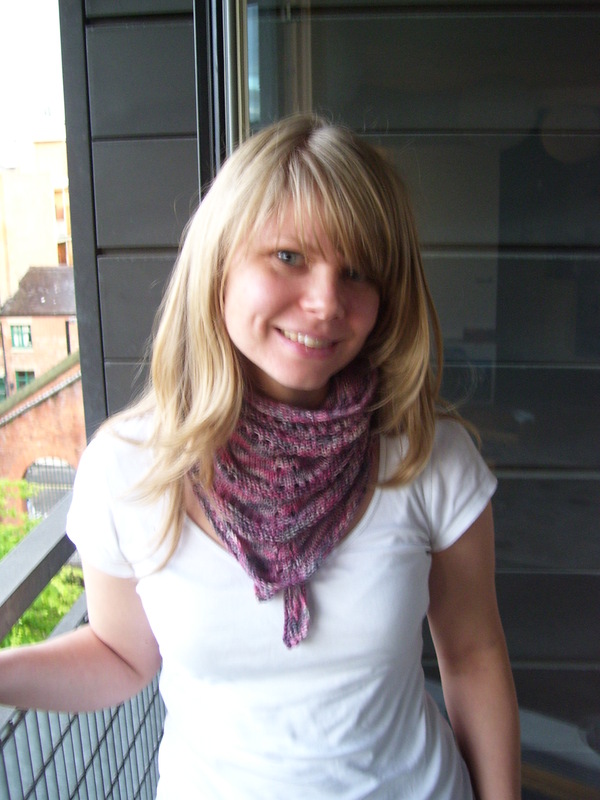 It’s also a nice mix between a shawl and a scarf as it’s a bit slimmer than most shawls, but is still clearly a shawl. And, it’s long enough to securely tie in the front without feeling choked. If the random thunderstorms of the last few weeks are anything to go by, it’s going to be a long, cold, wet winter, so I’m glad to have a little something nice to keep me warm while I’m knitting for other people. PS. 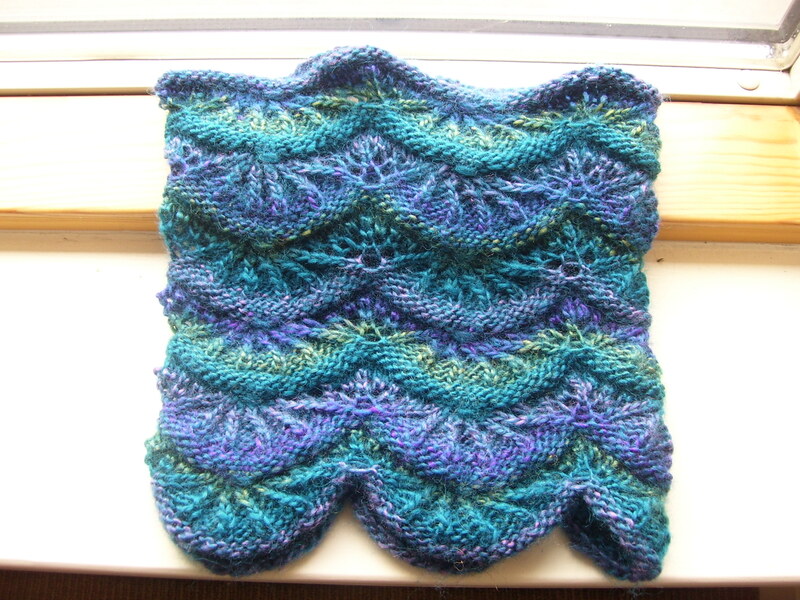 If you’re not on Ravelry 1) you should be and 2) you can find the Azzu’s Shawl pattern as a free pdf download here. My most recently completed craft project was a present for a Studio Ghibli themed swap. 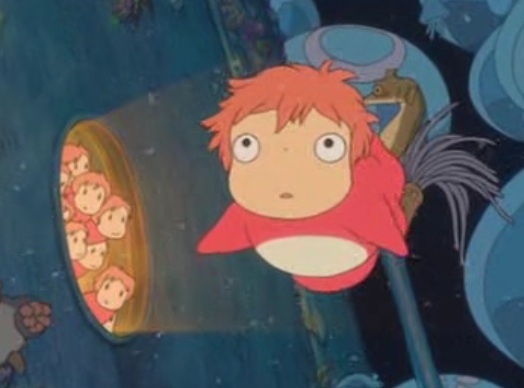 I based the theme around Ponyo. 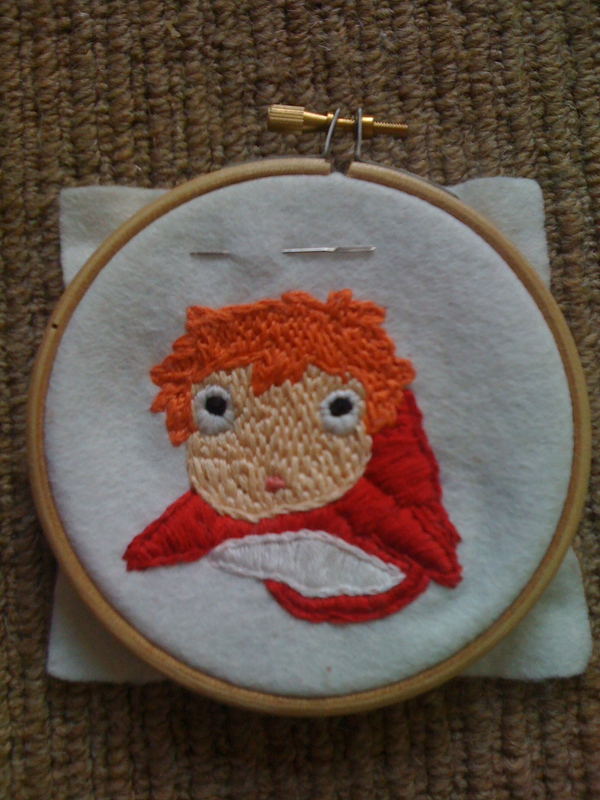 While it’s not massive in size, I’ve never done this much embroidery before, so it was a bit of a trial and error project and it could be better, but I really thought it would be much much worse, so I’m fairly pleased with the result. However, it doesn’t stop there. I carefully cut Ponyo out and made her into a little patch to be ironed and sewn onto a little wristlet project bag that I designed. 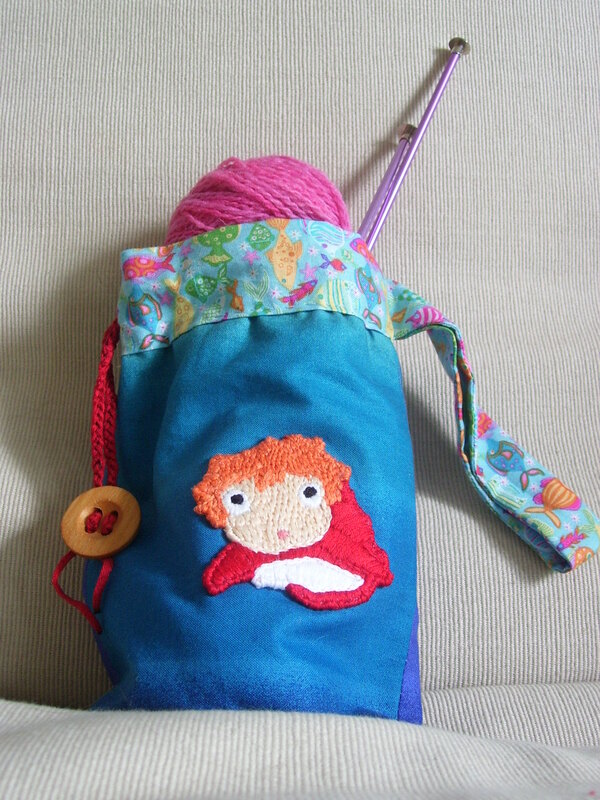 The drawstring is a crochet chain from red cotton tape and I used a large wooden button as the toggle. This was mainly because I couldn’t recall seeing a normal toggle thing at the craft store and didn’t feel like leaving the flat the day I was making it. Plus, buttons make everything cuter and those toggle things are ugly anyway. 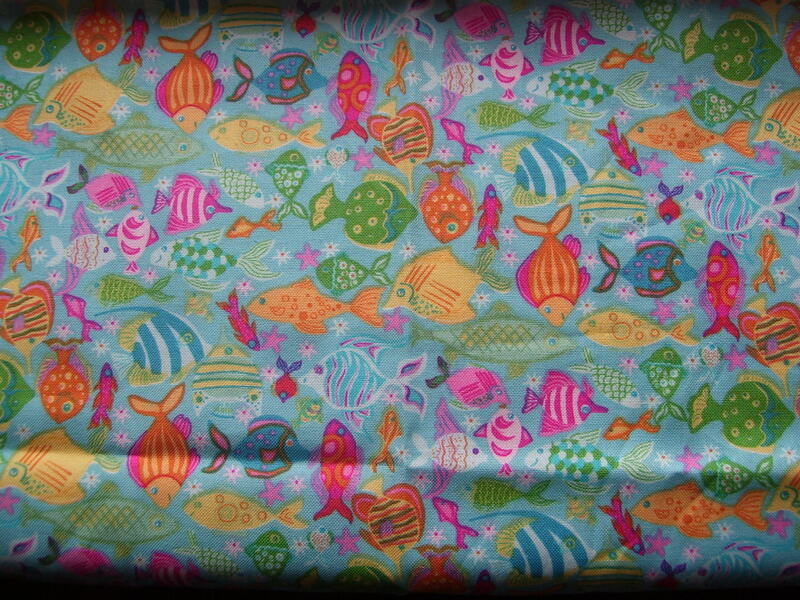 I found this really cute fish fabric to use as lining and since it’s so cute, I wanted it to show on the front of the bag. It also fit with the scene in Ponyo the patch came from as there’s a lot brightly coloured fish swimming around in the opening scenes. After finishing the bag, it didn’t seem like there was much to the package, so I also knitted Preita Salyer’s Green Sea Cowl in King Cole Mirage (colorway 871). It was a super easy pattern and really quick to knit. It turned out absolutely beautifully in the King Cole; it seemed magical how the colours stripped at all the exact right places to compliment the design. I haven’t been very selfish with my crafting over the last few months, and the trend isn’t over yet. I’m about to start the Christmas crafts because I’m planning on making some large and time consuming projects, so I may disappear for a while in the near future. But hopefully, there will be lots of shiny things to show upon my return.